Keating Building Corp., McKissack Group Inc.
Lincoln Financial Field is an American football stadium located in Philadelphia, Pennsylvania, United States. It serves as the home stadium of the Philadelphia Eagles of the National Football League (NFL) and the Temple Owls football team of Temple University. 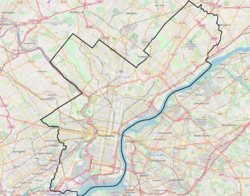 It is located in South Philadelphia on Pattison Avenue between 11th and South Darien streets, also alongside I-95 as part of the South Philadelphia Sports Complex. It has a seating capacity of 69,176. 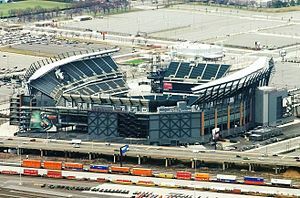 Many locals refer to the stadium simply as "The Linc". The stadium opened on August 3, 2003 after two years of construction that began on May 7, 2001, replacing Veterans Stadium. While total seating capacity is similar to that of "The Vet", the new stadium contains double the number of luxury and wheelchair-accessible seats, along with more modern services. The field's construction included several light emitting diode (LED) video displays, as well as more than 624 feet (190 m) of LED ribbon boards. Naming rights were sold in June 2002 to the Lincoln Financial Group, for a sum of $139.6 million over 21 years. Together, the City of Philadelphia and the State of Pennsylvania contributed approximately $188 million to the stadium construction. Additional construction funding was raised from the sale of Stadium Builder's Licenses to Eagles season ticket holders. The Army–Navy football game is frequently played at the stadium due to Philadelphia being located halfway between both service academies, the stadium being able to house the large crowds in attendance, and the historic nature of the city. Temple University's Division I college football team also plays their home games at Lincoln Financial Field, paying the Eagles $1 million a year to do so. 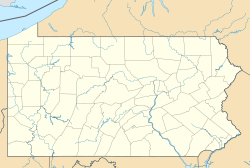 The Philadelphia Union of Major League Soccer have played exhibition games here against high-profile international clubs when their stadium Talen Energy Stadium does not provide adequate seating. The stadium also plays host to several soccer games each year. It has also played host to the NCAA lacrosse national championship three times, in 2005, 2006, and 2013 respectively. In late spring 2013, the Eagles announced that there would be some major upgrades to Lincoln Financial Field over the next two years. The total project estimate was valued at over $125 million. The upgrades included seating expansion, two new HD video boards, upgraded amenities, WiFi, and two new connecting bridges for upper levels. These upgrades were decided upon after research from season ticket holders, advisory boards, and fan focus groups. The majority of these changes, including WiFi (which would accommodate 45,000 users and have coverage over the entire stadium), were completed by the 2013 home opener. The upgraded sound systems and video boards were finished for the 2014 season. August 3, 2003: Lincoln Financial Field hosted its first ticketed event, a soccer match between Manchester United and FC Barcelona. August 22, 2003: The Philadelphia Eagles hosted the New England Patriots in the first pre-season football game at Lincoln Financial Field. September 6, 2003: Lincoln Financial Field hosted its first regular-season college football game, a college matchup of local Philadelphia rivals: Villanova and Temple. Villanova prevailed 23–20 in double overtime. September 8, 2003: The Eagles and the Tampa Bay Buccaneers competed on Monday Night Football in the first regular-season NFL game at Lincoln Financial Field. The game was referenced as the "Inaugural Game" at Lincoln Financial Field. The Buccaneers defeated the Eagles 17–0 in their new home. NFC Divisional Playoff: January 11, 2004 (Philadelphia Eagles 20, Green Bay Packers 17). This game is also known as "The Miracle of 4th and 26". Donovan McNabb connected on a 28-yard pass to receiver Freddie Mitchell on 4th and 26 late in the 4th quarter with the Eagles out of timeouts. This led to the game-tying field goal that sent the game into overtime. In the overtime period, Brett Favre tossed an interception to Brian Dawkins, which set up David Akers game-deciding 37-yard field goal that sent the Eagles to their third straight NFC Championship Game. NFC Championship Game: January 18, 2004: (Carolina Panthers 14, Philadelphia Eagles 3). Eagles lose their third straight NFC Championship Game. May 2004: Minor modifications were made to the stadium to change capacity slightly. Some seats were removed from the club box level to increase handicap access. The temporary seats were removed in the north east end zone and a permanent structure was erected and formally named The Pepsi Zone. It is designed as a family-friendly section. NFC Divisional Playoff: January 16, 2005: (Philadelphia Eagles 27, Minnesota Vikings 14). Eagles advance to their fourth-consecutive NFC Championship Game. NFC Championship Game: January 23, 2005: (Philadelphia Eagles 27, Atlanta Falcons 10). Eagles advance to the Super Bowl for the first time since 1980. NFC Wild Card Playoff: January 7, 2007: (Philadelphia Eagles 23, New York Giants 20). David Akers wins the game with a field goal as time expires. September 23, 2007: Wearing 1933 throwback uniforms celebrating the team's 75th anniversary, the Eagles set multiple team records in a 56–21 victory over the Detroit Lions; the second most points in team history. It was the first time the Eagles ever had a 300-yard passer (Donovan McNabb), a 200-yard receiver (Kevin Curtis), and a 100-yard rusher (Brian Westbrook) in the same game. April 10, 2010: The Philadelphia Union win their inaugural home opener, a 3-2 victory over D.C. United. A second match was played against FC Dallas on May 15; those games served as home games before the opening of PPL Park June 27 against Seattle Sounders FC. May 29, 2010: US men's national soccer team won their match 2-1 against Turkey in the last game of the 2010 World Cup Send Off Series. A crowd of 55,407 people attended, setting at the time a new attendance record for U.S Soccer at Lincoln Financial Field. July 21, 2010: Philadelphia Union hosted Manchester United on their North America tour. Manchester United won, 1-0. September 12, 2010: The Eagles honored the 50th Anniversary of their last NFL Championship as they wore replicas of the 1960 uniforms in a 27-20 loss to the Green Bay Packers. NFC Wild Card Playoff: January 9, 2011: (Green Bay Packers 21, Philadelphia Eagles 16). Michael Vick throws a game-ending interception. NFC Wild Card Playoff: January 4, 2014: (New Orleans Saints 26, Philadelphia Eagles 24). Shayne Graham kicks the game-winning field goal at the end of the game. 2015 CONCACAF Gold Cup Final: July 26, 2015: Mexico defeated Jamaica, 3-1, at a nearly sold-out event with 68,930 in attendance. October 31, 2015: Temple vs Notre Dame on ESPN Saturday Night Football on ABC in primetime in front of a sold-out record crowd of 69,280. Notre Dame defeated Temple by a score of 24-20. NFC Divisional Playoff: January 13, 2018: (Philadelphia Eagles 15, Atlanta Falcons 10). Jalen Mills blocks a potential game winning touchdown late in the fourth quarter. NFC Championship Game: January 21, 2018: (Philadelphia Eagles 38, Minnesota Vikings 7). Eagles advance to the Super Bowl for the first time in thirteen years, winning Super Bowl LII. NFL Kickoff Game: September 6, 2018: (Philadelphia Eagles 18, Atlanta Falcons 12). The Philadelphia Eagles hosted the Atlanta Falcons in a rematch of their 2017 NFC Divisional Playoff matchup. 2019 NHL Stadium Series: February 23, 2019: The Philadelphia Flyers defeat the Pittsburgh Penguins 4-3 in overtime, in front of a crowd of 69,620, the largest recorded attendance for a hockey game in Pennsylvania. For the inaugural season at Lincoln Financial Field (2003), the Eagles imposed a ban on hoagies and cheesesteaks being brought into the stadium, citing security concerns related to the events of September 11. The ban only lasted one week after much mockery by fans and sports radio, along with traditional media. Prior to the first Eagles game of the 2007 season, a ruling was made concerning a Philadelphia and national tradition: tailgating. While the Eagles did not ban the act entirely, they did ban the use of tables and tents as well as the purchasing of more than one parking spot per vehicle. Prices were also doubled to $40 for RVs and buses, and $20 for cars. Fans have been reported to be upset. There are 172 Luxury Suites at Lincoln Financial Field. They range in capacity from 12 to 40 people and cost $75,000 to $300,000 per year or $20,000 for a single game rental. The suites are located in six separate areas throughout the stadium. There are 3,040 luxury suite seats in total. There are 2 exclusive 40,000 sq ft (3,700 m2) club lounges in the stadium. The lounge on the west side is the "Panasonic Lounge" and the one on the east side is the "SCA Club Lounge". Suite holders and club seat holders have access to these 2 lounges. There are a total of 10,828 club seats in the stadium. These club seats feature some unique benefits above and beyond the lounges. One major benefit is the lounges open hours before the event, in most cases 2–4 hours. The lounges also have multiple full service bars in them. The seats in the club level are padded, and there is also a wait staff present to serve food and drinks. There are numerous parking lots surrounding Lincoln Financial Field. The parking assignments may change depending on other activities in the area on a particular day. According to the stadium's website all lots will cost visitors $40 and $80 for an oversized vehicle. Tailgating is allowed in all lots except for T-X lots. Majority of the lots are public cash lots, but visitors should visit the website Lincoln Financial Field Parking for more information before heading to an event. The Eagles decided after the 2012 season to move training camp back to Philadelphia. As a part of this new agreement the Eagles will have multiple practices, which are open to the public, at Lincoln Financial. The rest of the practices will be closed, and will take place across the street at the NovaCare Complex. Information about tickets and dates can be found at Training Camp Information. Lincoln Financial Field is the home field for Temple University football. On August 13, 2003, the Philadelphia Eagles and Temple University announced a 15-year agreement for Temple to play their home football games at Lincoln Financial Field. Temple played its first game at the Linc on September 6, 2003 against Villanova, the teams' first meeting since 1980. During the 2015 season, the Temple Owls sold out the Linc on two occasions. The September 5 season opener against Penn State, and again on October 31 in a prime time matchup against Notre Dame. Lincoln Financial Field is the primary home to the Army–Navy Game. The game has been played the most often in Philadelphia. It was played at Veterans Stadium for the final time in 2001, and prior to the Vet, at John F. Kennedy Stadium and Franklin Field. The Linc hosted the game five times between 2003 and 2009. It was announced on June 9, 2009 that the game would be played in Philadelphia at the Linc in 2010, 2012, 2013, 2015 and 2017. The stadium opened on August 3, 2003 with 68,396 attending a preseason friendly with Manchester United defeating Barcelona 3–1. It hosted some 2003 FIFA Women's World Cup matches. 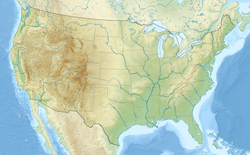 In 2004, after winning the gold-medal in soccer at the 2004 Summer Olympics, the U.S. women's team conducted a "Fan Celebration Tour", playing ten matches across the United States from September to December 2004. The matches were the final national team appearances for Mia Hamm, Joy Fawcett, and Julie Foudy, all of whom retired after the tour. The team played at the Linc on November 6, 2004 where they lost 3-1 to Denmark in front of 14,812 spectators. In late July and early August 2004, Manchester United returned to play Celtic and A.C. Milan played Chelsea in two friendly matches. On July 18, 2009, Lincoln Financial Field hosted a doubleheader quarterfinal for the 2009 CONCACAF Gold Cup. The first game was between Canada and Honduras, and the second between USA and Panama. This was the first full international appearance for the United States national soccer team in Philadelphia since a 1968 friendly against Israel at Temple Stadium. Lincoln Financial Field was listed by U.S. Soccer's World Cup bid committee as one of 18 stadiums to be potential sites for the United States to host the 2022 FIFA World Cup. Philadelphia Union played their home opener against D.C. United at the Linc on April 10, 2010 due to construction delays at their new stadium, PPL Park (now Talen Energy Stadium). The Union defeated United, 3–2. The Union also played FC Dallas to a 1–1 tie in the second home game in franchise history at the Linc. Although having moved into its permanent venue at Talen Energy Statium, the Philadelphia Union continue to use the Linc for matches where ticket demand is expected to far exceed the full capacity at its regular home. English powerhouse club Manchester United met the Philadelphia Union during their pre-season tour on July 21, 2010 where they lost 1–0. The Union played the Spanish powerhouse club Real Madrid on July 24, 2011, where they lost 2–1. Lincoln Financial Field also hosted the US National team's final match on home soil before the 2010 World Cup. The US defeated Turkey 2–1 on May 29, 2010. The US men's national team returned to Lincoln Financial Field on August 10, 2011, for an international friendly match against Mexico, where they tied 1-1. In 2012, the stadium hosted a World Football Challenge match between Real Madrid and Celtic F.C. with Real Madrid winning 2-0. On August 2, 2014, Lincoln Financial Field hosted a soccer match between A.S. Roma and Inter Milan which was part of the 2014 International Champions Cup. Inter Milan won the match 2–0. On July 26, 2015, the Linc hosted the final match of the 2015 CONCACAF Gold Cup. In 2016, the stadium hosted games in the Copa América Centenario. The Linc hosted a doubleheader of quarterfinals of the 2017 CONCACAF Gold Cup. On July 25, 2018, the Linc hosted a 2018 International Champions Cup match between Juventus F.C. and FC Bayern Munich that Juventus won 2-0. In the Summer of 2026, the Linc will host games for the 2026 FIFA World Cup. The NCAA Men's Lacrosse Championship in 2005, 2006 and 2013 were held at the stadium. The Philadelphia Phillies celebrated their 2008 World Series championship with a parade down Broad Street, appearance before a sold-out crowd at the Linc, and then a ceremony at Citizens Bank Park. The Citizens Bank Park ceremony was simulcast to the crowd at the Linc. Tickets to the event at Lincoln Financial Field were made available at no cost to the public and were gone within 45 minutes when they were made available at 3pm on October 30, 2008. Monster Jam performed at the stadium from 2010-2012 as part of the summer stadium tour. After a six year absence, Monster Jam returned to the stadium on May 5, 2018. Previous events took place during the winter at the Spectrum and the Wells Fargo Center from 2013-2015. 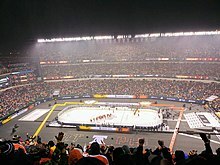 On February 23, 2019, the Philadelphia Flyers defeated the Pittsburgh Penguins 4-3 in overtime in the 2019 NHL Stadium Series in front of a crowd of 69,620, the largest record attendance for a hockey game in Pennsylvania. Sammy Hagar The Poets and Pirates Tour 49,169 / 50,017 $4,519,632 Before 2008 his tours were performed at Wells Fargo Center or Susquehanna Bank Center. His Summer Tours have been held here ever since. July 14, 2011 U2 Interpol U2 360° Tour 72,389 / 72,389 $6,536,230 The show was originally scheduled to take place on July 12, 2010, but was postponed, due to Bono's emergency back surgery. Joel Crouse The Red Tour 101,277 / 101,277 $8,822,335 On the show of July 20, 2013, after the opening acts performed, Swift was about to start her set, until heavy rain as well as lightning delayed the show. Shawn Mendes The 1989 World Tour 101,052 / 101,052 $11,987,816 Echosmith, Cara Delevingne & Mariska Hargitay were special guests. June 13, 2015 Rachel Platten and Mariska Hargitay were special guests. August 30, 2015 Kevin Hart N/A What Now? Tour 53,000 N/A First comedian to sell out a football stadium for a stand up comedy show. September 1, 2015 One Direction Icona Pop On the Road Again Tour 47,761 / 47,761 $3,079,651 During the performance, the band performed a cover of "The Fresh Prince of Bel Air" by Will Smith. June 5, 2016 Beyoncé DJ Khaled The Formation World Tour 47,223 / 47,223 $5,563,435 Heavy rain and lighting slightly delayed the start of the concert. Yo Gotti, Young Gunz, Freeway, Meek Mill , Nicki Minaj and Rick Ross joined DJ Khaled during the opening act. May 12, 2017 Metallica Volbeat WorldWired Tour 49,722 / 51,728 $5,421,187 Avenged Sevenfold was not able to appear as an opening act for Metallica due to Synyster Gates' wife going into labor. Charli XCX Taylor Swift's Reputation Stadium Tour 107,378 / 107,378 $11,951,047 During the second show, Swift performed "Our Song" and "Wildest Dreams" a cappella after the levitating basket stage used during "Delicate" malfunctioned. Jay-Z Chloe X Halle and DJ Khaled On the Run II Tour 54,870 / 54,870 $6,709,691 “Black Effect” was premiered and added to the setlist. The stadium is prominently featured in the opening of the TV show It's Always Sunny in Philadelphia. It also features in the third episode of season 3 of the show. In 2013, Lincoln Financial Field became the "greenest" NFL stadium to date. Energy-efficient additions include 11,000 solar panels, and 14 UGE-4K wind turbines outside and on top of the stadium respectively. These installations account for 30% of the electricity used to run the facility. 2013 also marked the fourth year in a row that the venue made the top of PETA's list of "Vegetarian-Friendly NFL Stadiums". ^ a b c d e f g "Lincoln Financial Field". SportsBusiness Journal. September 15, 2003. ^ "Lincoln Financial Field: Stadium Facts". Archived from the original on May 29, 2014. ^ "Philadelphia Union 0 United 1". manutd.com. Archived from the original on August 11, 2016. Retrieved July 27, 2015. ^ "Jamaica 1, Mexico 3 | CONCACAF Gold Cup Match Recap". mlssoccer.com. July 26, 2015. ^ Jeff Taylor, "Meal Ticket", Reason, July 22, 2003. Retrieved December 19, 2007. ^ Krista Hutz, "Unfazed fans party on as usual"[dead link], Philadelphia Daily News, September 18, 2007. Retrieved December 19, 2007. ^ "Eagles Fans Endure New Tailgating Rules", CBS 3, September 17, 2007. Retrieved December 19, 2007. ^ "Temple University Facilities". Temple Official Athletic Site. Temple University. Archived from the original on May 7, 2009. Retrieved June 17, 2009. ^ "Philadelphia gets Army-Navy game 5 of next 8 years". Yahoo! Sports. Associated Press. June 9, 2009. Retrieved June 17, 2009. ^ Morkides, Chris (August 4, 2003). "Manchester United Beats FC Barcelona 3-1". Associated Press. Archived from the original on October 22, 2012. Retrieved November 3, 2008. ^ "Houston Officially Added to Fan Celebration Tour with Oct. 23 Date". ussoccer.com. United States Soccer Federation. September 14, 2009. Archived from the original on April 25, 2012. Retrieved June 18, 2009. ^ "Manchester United Returns to lincoln Financial Field". Archived from the original on September 30, 2011. Retrieved August 13, 2011. ^ "Israel Official Games 1960-1969". Rec.Sport.Soccer Statistics Foundation. Archived from the original on April 26, 2009. Retrieved April 13, 2009. ^ "58 of 70 USA World Cup venue candidates express interest". Soccer By Ives. April 23, 2009. Retrieved April 24, 2009. ^ "2018-2022 US World Cup Bid List". Yahoo! Sports. June 17, 2009. Retrieved April 24, 2009. ^ "Linc still in running to host World Cup games". The Philadelphia Inquirer. August 20, 2009. Retrieved August 21, 2009. ^ "Man United to play 3 preseason games in US". sports.yahoo.com/sow. February 10, 2010. Retrieved May 6, 2010. ^ "U.S. TO FACE TURKEY IN PHILADELPHIA ON MAY 29. The US national team is heavily favored. IN SEND-OFF MATCH FOR 2010 FIFA WORLD CUP". lincolnfinancialfield.com. March 15, 2010. Archived from the original on February 18, 2010. Retrieved March 20, 2010. ^ "2005 NCAA men's lacrosse championships schedule". ESPN.com. May 30, 2005. Retrieved November 3, 2008. ^ Zolecki, Todd (November 1, 2008). "For Players, a Parade of a Lifetime". The Philadelphia Inquirer. Retrieved November 3, 2008. ^ "Free Parade Sports-Complex Tickets Gone". WTXF-TV. October 30, 2008. Archived from the original on January 10, 2009. Retrieved November 3, 2008. ^ "Bruce Springsteen and the E Street Band The Rising Tour 2002-3 Itinerary". Columbia Records Thrill Hill Productions, Inc. Archived from the original on November 13, 2008. Retrieved November 3, 2008. ^ "Taylor Swift Rocks Lincoln Financial Field". philadelphiaeagles.com. August 6, 2011. Archived from the original on August 9, 2011. Retrieved December 16, 2011. ^ DeLuca, Dan (July 22, 2013). "Taylor Swift RED Tour". Philly.com. Retrieved November 10, 2013. ^ "Lightning Forces Thousands Out of Linc During Taylor Swift Concert". Retrieved January 16, 2017. ^ "Review: Taylor Swift captivates 50,000 at Lincoln Financial Field". Retrieved August 2, 2015. ^ DeLuca, Dan (June 6, 2016). "Review: Beyoncé's impassioned Formation tour dazzles at the Linc". Philadelphia Daily News. Retrieved June 6, 2016. ^ "Avenged Sevenfold to make up for cancelled Philly show on Metallica tour with date in Camden". philly.com. May 15, 2017. Retrieved October 29, 2017. ^ Bailey, Alyssa. "Taylor Swift Had the Craziest Weekend and It All Started With a Stage Malfunction Mid-Concert". Elle. Retrieved July 22, 2018. ^ "Philadelphia Named Most Vegetarian-Friendly City for Sports Fans", CBS November 18, 2013." Wikimedia Commons has media related to Lincoln Financial Field.